You can use sets to compare and ask questions about a subset of data. Sets are custom fields that define a subset of data based on some conditions. Watch a video: To see related concepts demonstrated in Tableau, watch the free training videos Creating Sets (6:54 minutes) and Working with Sets (4 minutes). Use your tableau.com account to sign in. The members of a dynamic set change when the underlying data changes. Dynamic sets can only be based on a single dimension. In the Data pane, under Dimensions, right-click a field and select Create > Set. 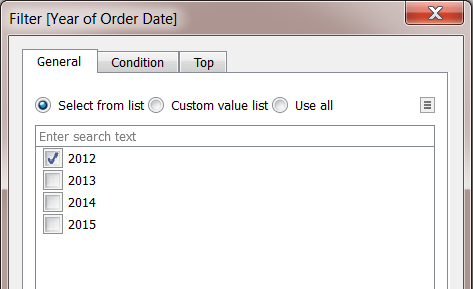 General: Use the General tab to select one or more values that will be considered when computing the set. You can alternatively select the Use all option to always consider all members even when new members are added or removed. Condition: Use the Condition tab to define rules that determine what members to include in the set. For example, you might specify a condition that is based on total sales that only includes products with sales over $100,000. Note: Set conditions work the same as filter conditions. See Filter Data from Your Views to learn more. 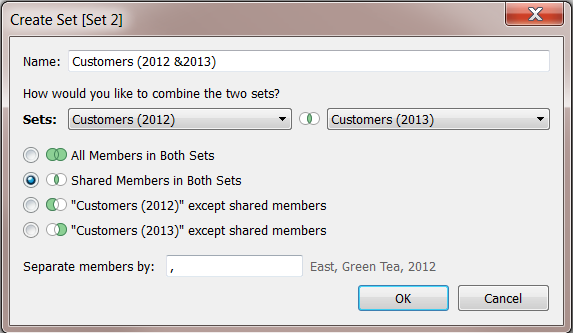 Top: Use the Top tab to define limits on what members to include in the set. For example, you might specify a limit that is based on total sales that only includes the top 5 products based on their sales. Note: Set limits work the same as Filter limits. See Filter Data from Your Views to learn more. The new set is added to the bottom of the Data pane, under the Sets section. A set icon indicates the field is a set. The members of a fixed set do not change. A fixed set can be based on a single dimension or multiple dimensions. In the visualization, select one or more marks (or headers) in the view. Right-click the mark(s) and select Create Set. Remove any dimensions that you don't want to be considered by clicking the red "x" icon that appears when you hover over a column heading . Remove any specific rows that you don't want to include in the set by clicking the red "x" icon that appears when you hover over the row . If the marks you selected represent multiple dimensions, each member of the set will be a combination of those dimensions. You can specify the character that separates the dimension values. To do so, for Separate members by, enter a character of your choice. 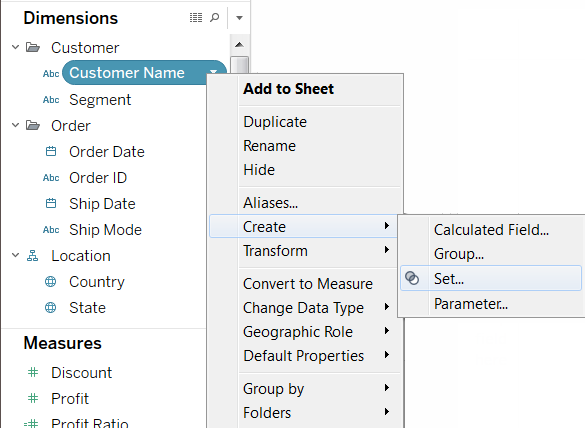 If you created a set using specific data points, you can add more data to or subtract data from the set. In the visualization, select the data points you want to add or remove. In the tooltip that appears, click the Sets drop-down icon, and then click Add to [set name] or Remove from [set name] to add or remove data from a particular set. After you create a set, it displays at the bottom of the Data pane in the Sets section. You can drag it into the viz like any other field. 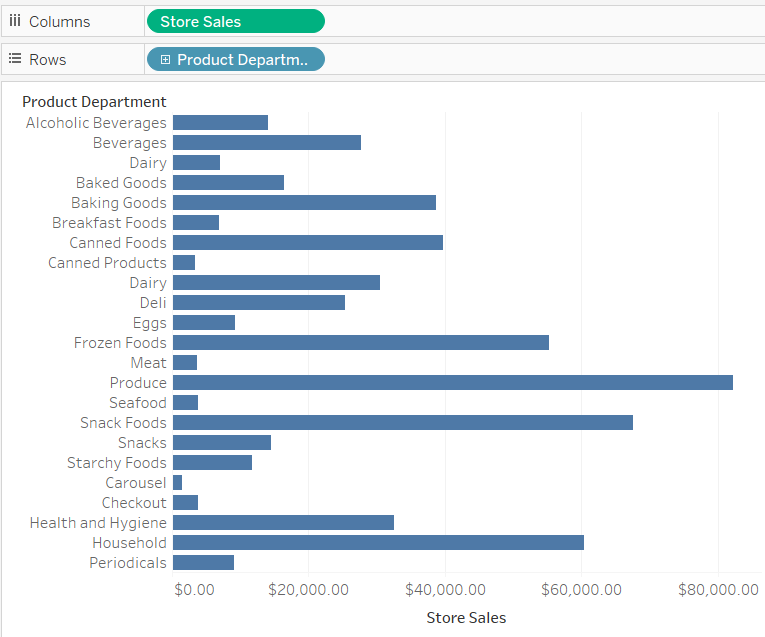 When you drag a set to the viz in Tableau Desktop, you can choose to show the members of the set or aggregate the members into In/Out categories. 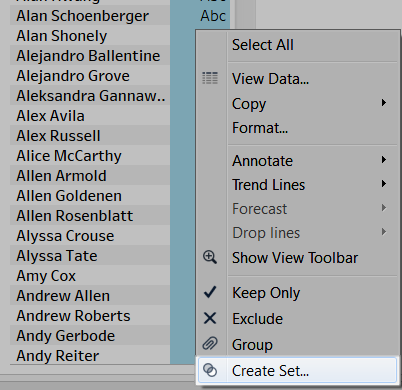 In Tableau Server or Tableau Online you can only aggregate the members of the set into In/Out categories. In - The members in the set. Out - Any members that are not part of the set. For example, in a set defined for the top 25 customers, the top customers would be part of the In category and all other customers would be part of the Out category. Using the In/Out mode makes it easy to compare the members in the set to everything else. 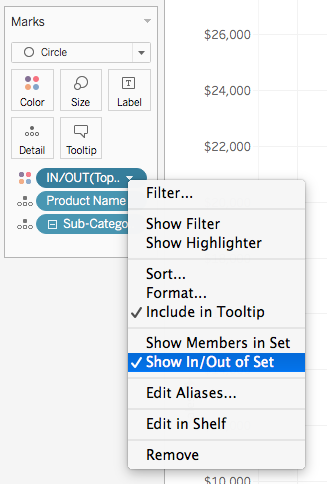 In Tableau Desktop, right-click the set in the visualization workspace and select Show In/Out of Set. In the visualization workspace, right-click the set and select Show Members in Set. 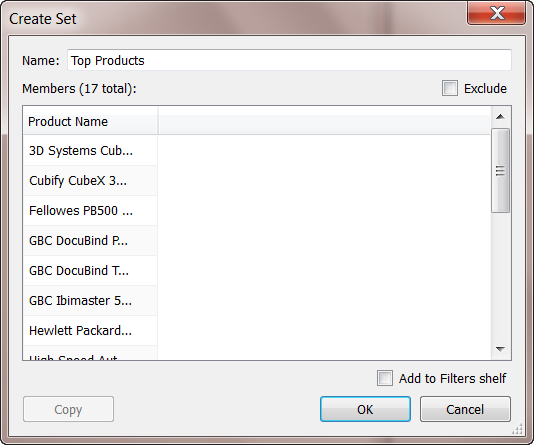 Note: To display the fully qualified member names for cubes, right-click the set in the Data pane and select Qualify Member Names. You can use set actions to give your audience more control over their analysis of your visualization. 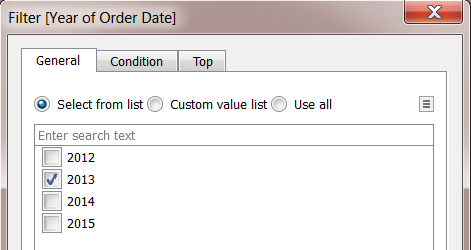 Set actions take an existing set and update the values contained in that set based on a user’s action in the viz. As the author, you can use a set or sets that you have already created to define the scope of the set action. For details on how to create and use set actions, see Set Actions. You can combine two sets to compare the members. When you combine sets you create a new set containing either the combination of all members, just the members that exist in both, or members that exist in one set but not the other. Combining sets allows you to answer complex questions and compare cohorts of your data. For example, to determine the percentage of customers who purchased both last year and this year, you can combine two sets containing the customers from each year and return only the customers that exist in both sets. To combine two sets, they must be based on the same dimensions. That is, you can combine a set containing the top customers with another set containing the customers that purchased last year. However, you cannot combine the top customers set with a top products set. In the Data pane, under Sets, select the two sets you want to combine. Type a name for the new combined set. You may have all kinds of questions surrounding how the members in a set contribute to the overall total. For example, what percent of total sales come from repeat customers? You can answer these types of questions using the IN/OUT mode for a set. The example below uses sales data to create a set for customers who have purchased 5,000 USD or more in products. 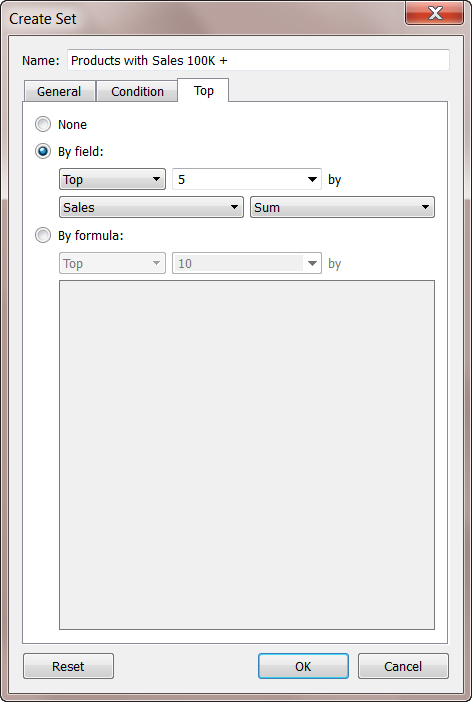 Right-click (control-click on Mac) the Customer Name dimension in the Data pane and select Create > Set. In the Create Set dialog box, type a name for the set. 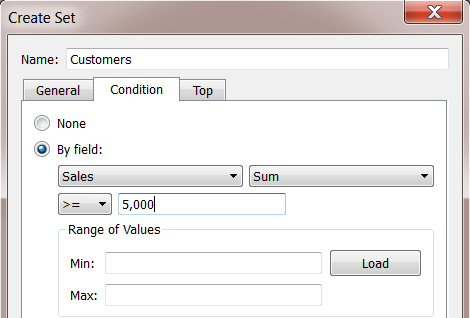 In this example, we'll call the set, "Customers"
On the Condition tab, click By field, and then define a condition that only includes customers when Sum of Sales is greater than or equal to 5,000. 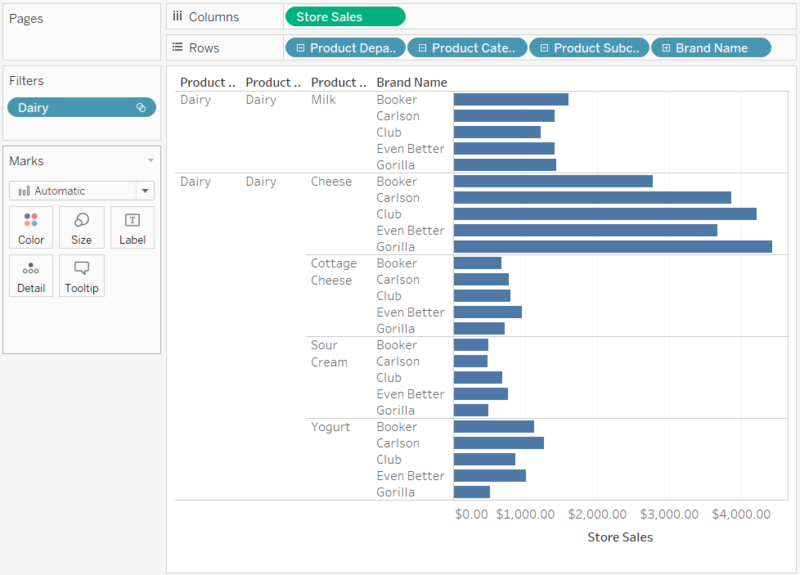 Drag the new set from the Sets area at the bottom of the Data pane to the Rows shelf. From Measures, drag Sales to the Columns shelf. The view now shows the total sales for customers who have purchased more than 5,000 USD of product and the total sales for all other customers. 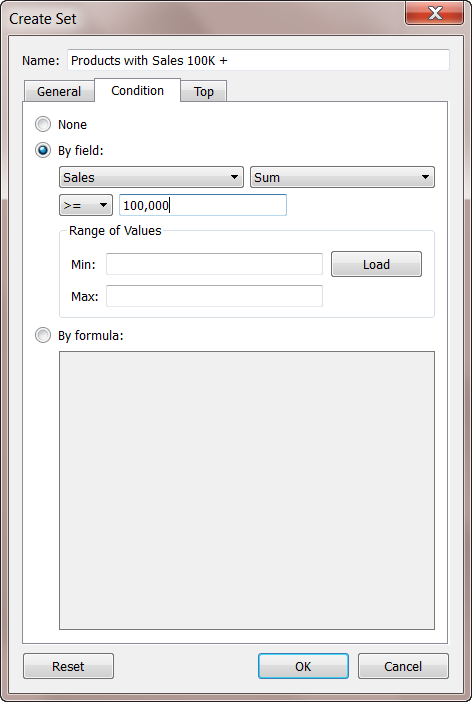 Finally, click on the drop-down arrow on the Sum (Sales) field on the Column shelf and select Quick Table Calculation > Percent of Total on the context menu. The view now shows that customers with sales greater than or equal to 5,000 make up about 39% of the overall sales. Another common use of sets is to compare subsets of data or cohorts. For example, you may wonder how many customers that purchased last year also purchased this year. Or if a customer purchased a specific product, what other products did they buy? You can answer these types of questions by creating multiple sets and combining them. The example below uses sales data to determine how many customers who purchased in 2012 also purchased in 2013. 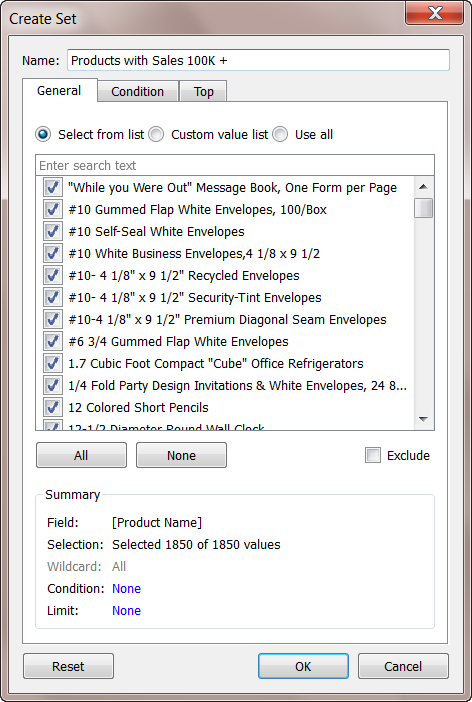 In the Filter dialog box, select 2012 and click OK.
Back in the view, press CTRL + A (Command-A on a Mac) on your keyboard to select all of the customers. Right-click (control-click on Mac) the selection and select Create Set. In the Create Set dialog box that opens, type a name for the set. In this example, we'll call the set "Customers (2012)". On the Filters shelf, right-click (control-click on Mac) Order Date and select Edit Filter. In the Filter dialog box, change the filter to only include 2013 instead of 2012, and then click OK.
Again, press CTRL + A (Command-A on a Mac) on your keyboard to select all of the customers. In the view, right-click (control-click on Mac) the selection and select Create Set. In the Create set dialog box that opens, type a name for the set. This set will be called "Customers (2013)". In the Data pane, select both the Customers 2012 and Customers 2013 by holding the Ctrl key (Command key on a Mac) on your keyboard as you select. Right-click (control-click on Mac) the selection and select Create Combined Set. In the Create Set dialog box, type a name for the new set. In this example, we'll call the set "Customers (2012 & 2013)". At the bottom of the workbook, click the New Worksheet icon. 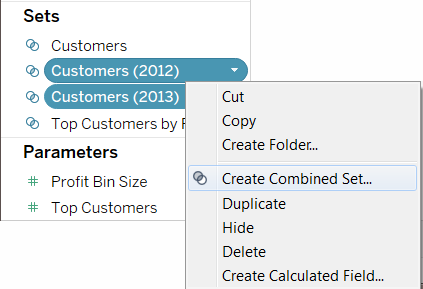 In the new worksheet, drag the Customer Name dimension to the Rows shelf. Click the drop-down arrow on the Customer Name field on the Rows shelf and select Measure > Count (Distinct) from the context menu. 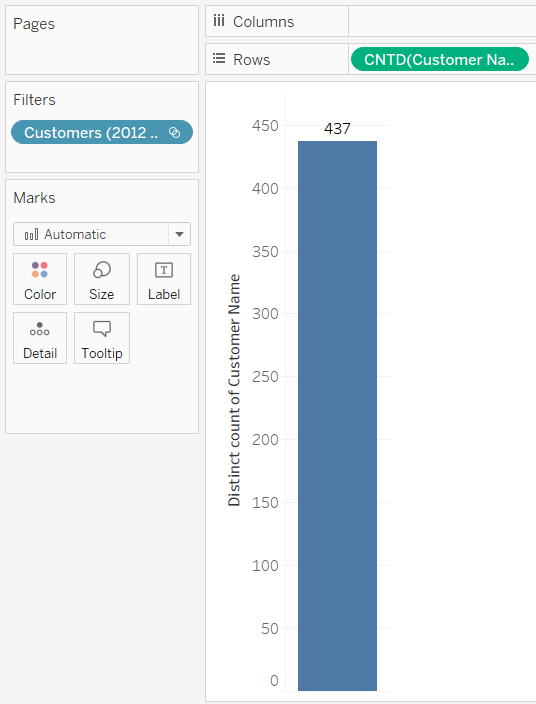 Finally, from the Sets area of the Data pane, drag the Customers (2012 & 2013) field to the Filters shelf. You can see that 437 customers purchased products in both 2012 and 2013. A hierarchical set filters data to the selected members and all of their descendants. They are unique to multidimensional (cube) data sources and are defined within the data source prior to connecting to Tableau Desktop. When you create sets in Tableau from a cube data source, descendants and any hierarchical structures are automatically included with the selected members. 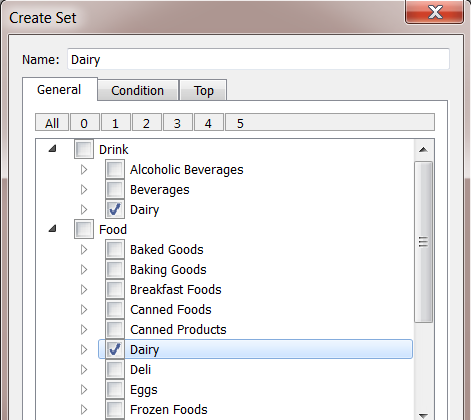 For example, a set named Dairy is created from the Product hierarchy. As shown below, it includes only the Dairy product department. Consider the following view. The Product Department dimension is placed on the Rows shelf and the Store Sales measure is placed on the Columns shelf.